Politics is not the only scene with some unexpected players in the top jobs – fashion, too, has its fair share of unusual choices and dramatic exits. The world is an uncertain place right now and fashion is no exception. Change is its lifeblood but most brands have a house style established by the founding designer. This DNA is seen as a precious asset, to be respected by creative successors and abandoned at commercial peril. In the past, seasonal trends would be in luscious tweeds at Chanel, exquisite femininity at Dior and in sharp tailoring at Saint Laurent. No longer – except for Chanel. Karl Lagerfeld, who arrived in 1983, understood the uniqueness of the image that Coco Chanel had created and keeps her principles at its heart. Chanel remains one of the world’s most successful and widely recognised brands. Today’s global market is everyone’s oyster and each luxury brand wants a part. Fashion’s great houses were founded by exceptional individuals who employed exceptional craftspeople. Haute couture, high jewellery and handmade bags retain a sense of luxury creativity, but is a mass-produced small leather accessory luxury simply because it bears a revered name? And should brands employ high-profile designers with strong creative images unless they are a good stylistic fit? These are the dilemmas faced by houses when founders die or retire, and when they become part of less personal groups with a shareholder agenda. This leads to instability, as designers not reaching targets are replaced – a three-year contract is considered long – and brands’ sartorial images keep changing. This may not matter, as long as the designs make headlines, as for most, accessories and perfumes make far more money than expensive clothing. There have been many headlines recently as designers play musical chairs. 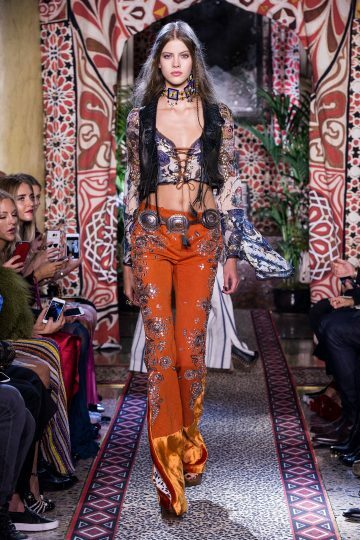 Few expected Peter Dundas to be ousted after three collections at Roberto Cavalli; he spent his formative years there and was a major hit at Pucci before returning to what seemed like his dream job. 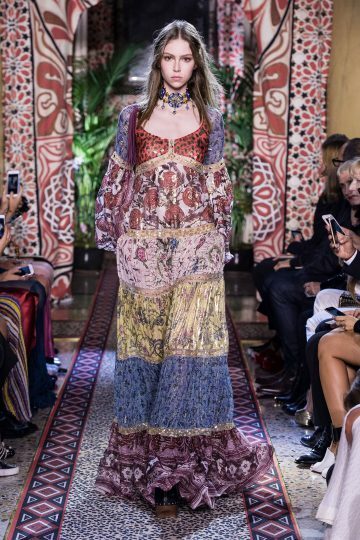 His ultra-luxe boho summer collection reflects the house DNA, yet next season’s design and direction are uncertain. 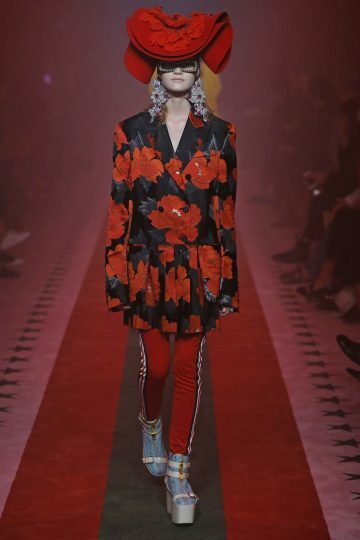 The surprise is greater because maximalism is currently in, driven by the magpie vision of Alessandro Michele at Gucci, whose collections have grown more ornate over two years. Everyone loves the vintage quirkiness, the sparkles, the detailed craftsmanship at new heights for spring 2017, but already there are calls for him to ditch the mash-up and show he can move on. While his equally high-toned accessories act as a cash cow, the brand will keep milking it. More controversial is Balenciaga’s choice of Demna Gvasalia, the disruptive genius behind Vetements. Cristobal Balenciaga was a brilliant couturier who designed strictly, and radically, for the elite and closed his house rather than modernise. When it reopened, Nicolas Ghesquière’s original talent made it fit for today’s world (whether he can do the same at Louis Vuitton is another matter) but Gvasalia’s populist and street style tendencies are a shock. His spring collection runs from the striking to the jolie laide but succeeds in making 1980s style look desirable. Customers want something fresh, and Gvasalia delivers. No matter that, apart from boldness, it bears no relation to the brand’s history. He used to work for fashion thinker and recluse Martin Margiela, to whom recycling and subversion were second nature – traits also appealing to John Galliano, who is quietly using the house codes for his work at Margiela while slowly adapting it to his own off-beat vision. More mainstream is Anthony Vaccarello as Hedi Slimane’s successor at Saint Laurent. He swaps Slimane’s 1970s grunge obsession for the slick, black 1980s YSL look that Slimane addressed in his final collection, and which Vaccarello always loves. Commercial, but we wait to see him use the many other influences in Yves’ masterworks. 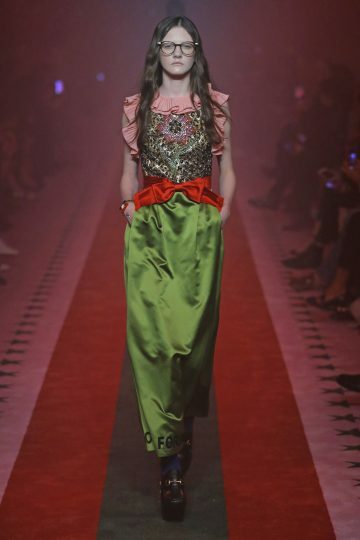 Another surprise was Alber Elbaz leaving Lanvin, where he had been synonymous with a tough-tinged but wearable femininity for a decade, though the verve slowly decreased. His unexpected successor is Bouchra Jarrar, a sophisticated couturière, whose beautiful, effortless and sometimes androgynous take on classics like the trench, the biker jacket and the bias-cut dress has many chic followers. She brings this laidback style in sumptuous fabrics to Lanvin, mainly in monochrome with satin, pinstripes and big silk orchids in a spring collection that seems perfect for the house. There are parallels with the first collection from the designer moves’ big female winner, Maria Grazia Chiuri. She has gone from being one of the duo that brought Valentino younger clients after its founder retired, to being the first woman designer at Dior – ironic for a house so wedded to femininity. 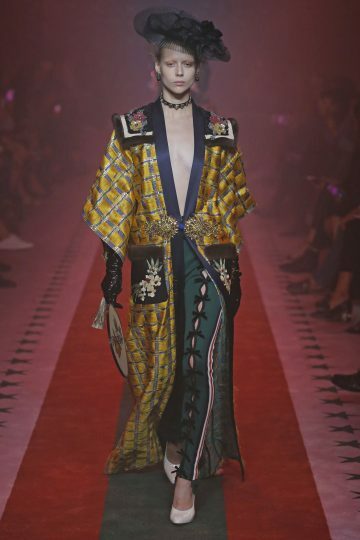 But it is a nostalgic femininity, and Chiuri wants to speak to modern women, with more monochrome androgyny, fencing jackets and slogan T-shirts among the Tarot symbol tulle skirts and softer, more womanly tailoring. 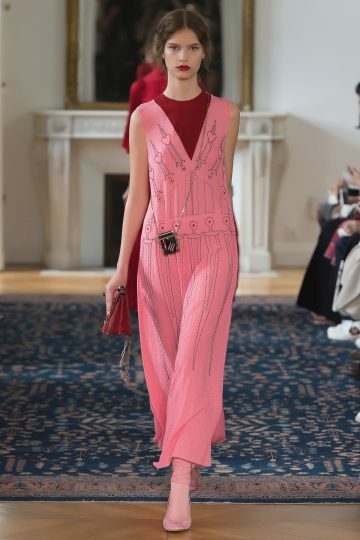 Interestingly, with Pierpaolo Piccioli, she gave Valentino an aura of ultra-feminine, almost Medieval romance; a strong thread, though cleaner-lined, in Piccioli’s first solo collection, but her vision appears the tougher. 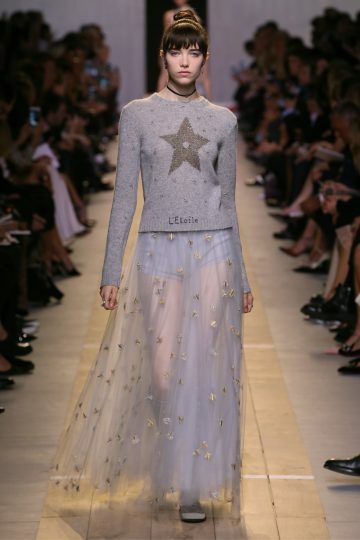 Grazia Churi’s predecessor at Dior, Belgian minimalist Raf Simons, has gone to Calvin Klein, the originator of clean-lined modern clothes – probably a better fit than Dior, where he never seemed quite comfortable. His first collection, for autumn, will be notable, though not the fashion earthquake that will hit when Lagerfeld calls time at Chanel.